We started a podcast! 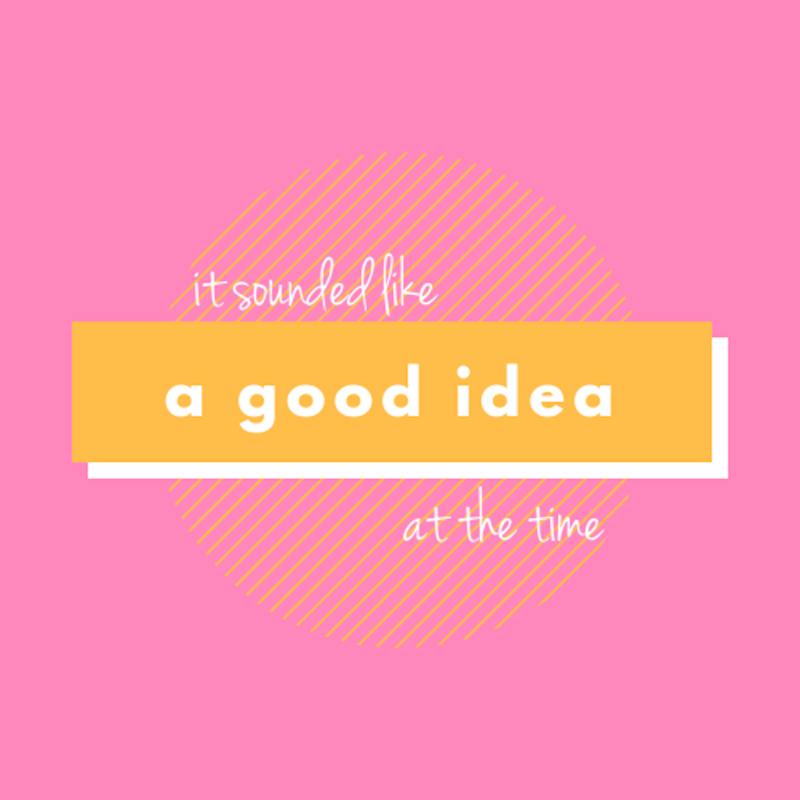 Last week, my friend Hannah and I excitedly launched “It Sounded Like a Good Idea at the Time,” a fresh, in-the-trenches dialogue about womanhood and motherhood from decidedly non-experts. Our goal is to provide topical conversation without presuming to make suggestions for ways to improve your life. As neighbors and moms of kids almost exactly the same age, we discovered that we gleaned incredible value from just… talking. Sharing stories of what has worked in our homes, careers and personal lives… and, usually laughably, what hasn’t. In fact, Hannah and I had both separately been thinking about starting a podcast for months, and had independently thought about asking the other to do it together. When we finally DID bring it up, things happened quickly since it felt like we were picking up mid-conversation. We’ll be sharing episodes each week, and we’d love for you to join in by subscribing/downloading, following us on Instagram, or on Facebook! Not only have I been cooking up some exciting projects, but I’ve also been cooking up some really delicious dishes. Here’s a quick look at those! Spiced Pumpkin Cinnamon Roll Pancakes – my lovely little butter spiral was MUCH more of a central glob, but the end result was really fantastic. I’ll certainly be making these again this season. Maple Pecan Banana Muffins – I don’t have a whole lot to note about these, but they are good! Multigrain Waffles – can’t stop, won’t stop with these babies. Seriously. Ham and Cheese Waffles – these are BANGIN’ for breakfast or lunch (they were a fun lunchbox addition). We alllll loved them. I didn’t have or use buckwheat, and instead followed this yeasted waffle mix and then added the ham and swiss. Butternut Squash Carbonara – after the first bite, Nora Beth declared this “DEWICIOUS,” and Annablair chimed in with a signature, “ME DOO!” They both ate 2 platefuls, while I stood over the pan taking bites. I used bacon instead of pancetta, and I left the sage leaves off their, but gladly ate it on mine. Cornmeal Fried Pork chops with Goat Cheese Smashed Potatoes – The pork chops were fine. The potatoes were AMAZING. Sausage & Tortellini Soup – this is one of our cold weather go-tos. It fast, hearty and really tasty. The girls aren’t wild about soup, but this can be sold as noodles, and they glad eat that right up. Chicken Posole – clearly I have been in a soup mood. This was my first time making chicken posole, and it most definitely will not be my last. Korean Beef Bowls – simple, easy and yummy. Best combo out there, right? Crockpot Maple Chipotle Pork with Cheesy Polenta – I hadn’t made this in almost a year, but I’m wondering what took me so long to add it back into our arsenal. The flavors are delicious, and it’s my favorite type of crockpot meal – just a few ingredients that get dumped in. Chicken Paprika with Gnocchi – chicken paprika is pure comfort food for me. I adore it. The recipe calls for homemade dumplings, which I’ve done before, butttt on a wild hair I used gnocchi instead, and I will never look back. Easy Ham and Swiss Stromboli – this was a HIT for the girls’ lunches and dinners last week. Admittedly, the first day I served it they weren’t too sure, but the rest of the week, they clamored for it and asked for more. Instead of ham, I used leftover rotisserie chicken (only because I didn’t want to toss it out). It was so easy, and I know I’ll be making it again. Chicken Tinga Tacos – I love Mexican food, but I feel like it can get a little redundant. This tinga switches flavor profiles and gives a nice break from the staple salsa, corn and black bean brigade. Homemade Spaghetti-Os – Nora Beth and Annablair were biiiig fans of this. Does it take longer than opening a can of Chef Boyardee? Sure. Is it worth it? Yep. 20 Minute Zuppa Toscana – I’ve never been to Olive Garden, but this is a soup everyone raves about. This easy recipe has me seeing why. Baked Chicken Meatballs – another week, more meatballs. Queso Crockpot Chicken Chili – I had heard raves about this chili, and I’m really glad I made it. Next time, I’ll choose milder salsa, because our batch was reallllll spicy. Sheet Pan Chicken Thighs with Magic Spice Blend – I can attest that this spice blend is super delicious, and I’ll be using it on lots and lots of things. Annablair loved it. Nora Beth proclaimed it too spicy.